There might be more pleasant ways to while away a mild, sunny school day than sitting outside and writing about anything you see around you. 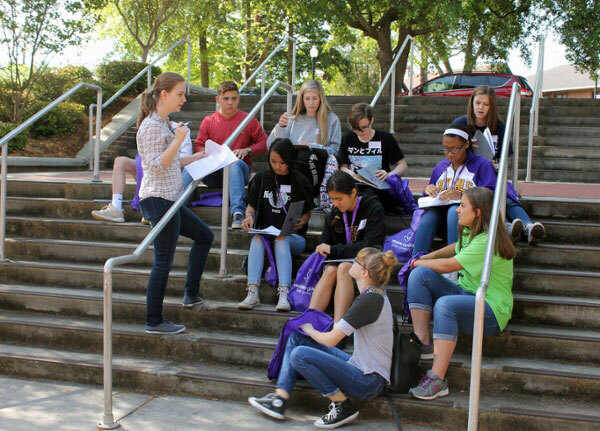 But based on the intensity of their concentration, some 30 Bleckley County High School freshmen seemed perfectly content as they participated in an outdoor writing marathon at Middle Georgia State University's Cochran Campus. "I thought it was cool," said Shy Chambers, 14, one of the honors English students who participated in the University's first Knight Writers daylong camp on April 13. "Definitely something different," said one of her classmates, 15-year-old Kevin Jessup. "It's fun to be here." The outdoor writing marathon was one of several activities featured at Knight Writers, an event organized by Dr. Lorraine Dubuisson, associate professor of English. "I wanted to do a project that would connect Middle Georgia State to the community, and it seemed like a good idea to start with the local school system," said Dubuisson, who has been teaching at MGA for 10 years. With the help of some of her colleagues and MGA students, Dubuisson planned Knight Writers camp events focused on writing skills and analyzing poetry. The high school freshmen - all of whom take honors English from BCHS teacher Wes Young - discussed poems by Langston Hughes, Maya Angelou, and Edgar Allan Poe, then created word art based on them. For the writing marathon, the students - divided into three groups - moved about the Cochran Campus, writing about things they observed. A group lunch in Georgia Hall with a speaker and more discussion rounded out the day. Three Middle Georgia State students helped plan and lead Knight Writers activities. Logan Gibbs, a psychology major, and English majors Katelyn Gill and Rachel Maddox, are working on a research project about teaching methods based in part on the writing camp experiences. They will present their findings at MGA's annual undergraduate research conference. Dubuisson hopes Knight Writers becomes an annual event. Besides enhancing the relationship between MGA and the Cochran community, the camp could help recruit more Bleckley County High students to the University. "I could be teaching some of these students in my Middle Georgia State classes soon," she said. For more Knight Writers photos, see the Middle Georgia State University Facebook page.